Not long ago, the Russian Air Force was in really bad shape. Almost all of its planes were 20-25 years old, outdated, and in poor condition. It’s therefore not at all surprising that the State Armament Program made procurement of new aircraft a priority, with a total investment of 4 trillion rubles in that sector alone. In this week’s VPK, CAST’s Andrei Frolov and Mikhail Barabanov discuss these plans. Some of the largest investments are in military transport aircraft. Frolov and Barabanov mention contracts in place to purchase 20 An-124 heavy transport aircraft starting in 2015, 39 Il-476 (aka Il-76MD-90A) heavy transport aircraft starting in 2014, 11 An-140 light transport aircraft (2 of which have already been delivered), and up to 30 Czech L-410UVP light transport aircraft (7 of which have already been delivered). In addition, there are plans to purchase up to 50 Il-214 MTA multi-role transportation aircraft, which are expected to be ready for production by 2016, and up to 20 An-148 passenger transport planes. Finally, 41 Il-76s and 20 An-124s will undergo modernization. Frolov and Barabanov mention the possibility of a tender for up to 100 Il-112 light transport planes, though this seems unlikely to me given that the MOD has previously rejected this plane in favor of the Antonov design. The military is also planning to buy up to 30 refueling planes that will be based on the Il-476. There are also plans to buy an unspecified number of A-100 AWACS planes, which are currently under development, and 4 Tu-204 reconnaissance planes. These will serve in conjunction with 12 modernized A-50 AWACS planes and 10 modernized MiG-25RB reconnaissance planes. In terms of strike aircraft, the air force is placing a big bet on the T-50 fifth generation strike fighter. Sixty of these planes are expected to be procured starting in 2016 (originally planned for 2014). While four T-50 prototypes are already being tested by the air force, by all indications new engines and advanced electronic systems (and especially its avionics) are not yet ready. This may lead to another round of delays in serial production. While waiting for the T-50, the air force is receiving new S-35S “generation 4++” strike aircraft, 48 of which were ordered in 2009 for delivery through 2015. Four have been received to date. Barabanov and Frolov believe that an additional 48 or 72 Su-35’s may be ordered once the current order is complete. The air force is also slated to receive 30 Su-30SM fighters by 2015, with an option for an additional 30 planes. The first two of these have already been received. The Russian military has also received 4 Su-30M2s and 12 Su-27SM3s in the last couple of years, but is not planning to acquire any more planes of either type. Older planes are being modernized, including a total of 120 Su-25s (50 already upgraded) and 120 MiG-31s (at least 25 to be completed by the end of 2012). In addition to the fighters, the air force has ordered 129 Su-34 fighter-bombers to be delivered by 2020, with an option for at least another 18. Fifteen of these planes have already been delivered. In the meantime, the air force is continuing to modernize its existing stock of Su-24s, with 50 already modernized and 50 to be upgraded before 2020. In terms of training aircraft, 18 Yak-130s have been delivered as of October 2012, with another 49 on order and an option for another 10. The air force is also purchasing 12 Su-25UBM two-seaters that will likely be used for training. By comparison, long-range aviation will get very little over the next decade. There are no plans to complete the two or three remaining Tu-160 strategic bombers whose production was started back in the Soviet period. Discussions about designs for a new long range bomber are continuing, but it remains uncertain whether the military will decide one is needed any time soon. In any case, production of new long range bombers would not start until after 2020. The only contracts in this sector are for modernization, including 30 Tu-22M3 bombers, 14-16 Tu-160 bombers, and up to 30 Tu-95MS bombers. In terms of rotary-wing aircraft, there are contracts in place for 167 Mi-28N (45 already delivered), 180 Ka-52, and 49 Mi-35M (10 already delivered) attack helicopters. Transport helicopter orders include 38 Mi-26 heavy lift helos. Six have already been delivered and another 22 may be ordered in the future. Up to 500 Mi-8s of various types will be purchased. These are currently being produced at a rate of 50 per year. There are also contracts in place for 36 Ka-226 (6 already delivered) and 32 Ansat-U (16 delivered) light transport helicopters. Additional contracts for 38 Ansat-U and up to 100 Ka-62 helicopters may be placed in the near term. There is also discussion of the possibility of purchasing 100-200 Eurocopters for training purposes, though I personally find this unlikely. For those who read Cyrillic, here’s the (much prettier) Russian language version from their article. I would suggest treating this as the upper bound of what the Air Force could potentially have in 2020. Delays in production are almost certain to lead to reductions on the left side of the table, while inability to keep old aircraft in working condition will most likely decrease the numbers on the right side as well. One final point — the authors of the VPK article argue that the greatest problem facing the air force by the end of the decade will be not a lack aircraft, but a lack of modern armaments for these aircraft. They argue that the air force will continue to lack air-to-air missiles with active radar guidance, smart bombs, and missiles with satellite guidance systems. They also believe that the Russian military will continue to lag well behind in UAV development. I am actually expecting the Russian military by 2020 to somewhat decrease the gap in both precision guided munitions and UAVs when compared to Western militaries. Its capabilities won’t be anywhere near those of the United States, but they will be closer to it than they are now. This is because Russian defense industry in these two sectors are actually in pretty good shape and have some good designs that could be put into production fairly quickly. So my takeway from all this is that in eight years the Russian air force will have lots of new planes, though not quite as many as they hope, and that these planes will be somewhat better armed than they are now. This entry was posted in Russian Air Force and tagged helicopters, MiG, Russian Air Force, Sukhoi, UAVs. Bookmark the permalink. 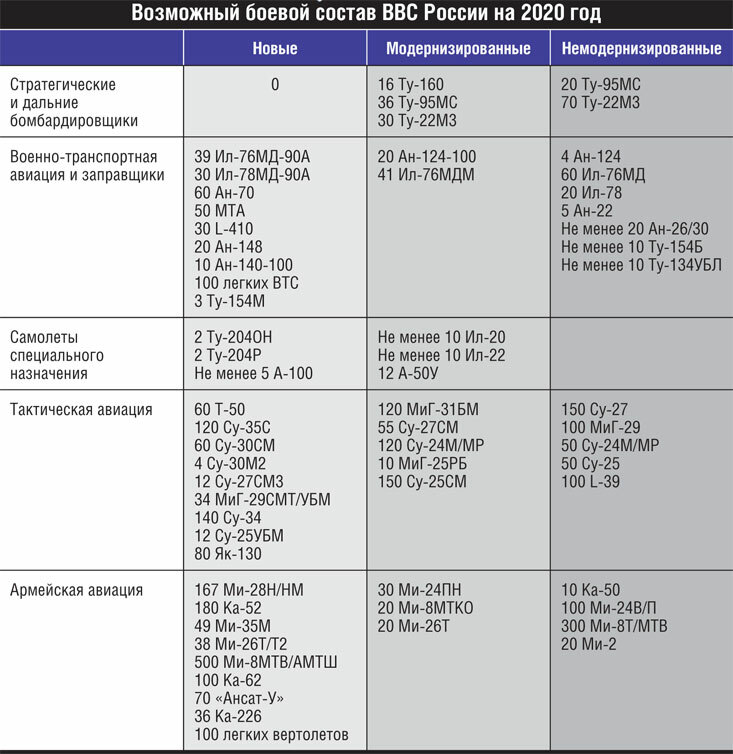 Looking at the history of delays, initial dates for some of the modernisation programs (Mig-31 for instance) and actual numbers received so far compared to total numbers planned, I think, the Russian airforce will be very lucky to receive half the numbers displayed in this chart. Recent statements such as the ones discussed here have made a bit of a big splash in some western circles, but really I see no reason whatsoever to get excited. Russian military modernisation has changed its pace from “inert” to “showing a few signs of life”. Last but not least, since the airforce historically is the most prestigious and best financed of the three services, such an assessment goes to show, in what severe troubles both army and navy still are (esp. naval service with its history of procurement failures). Last thought: the R-77 uses terminal phase-active radar. Feature-wise, the R-77/R-73 combo reflects what western airforces are now procuring for themselves (and in 1990 Russia was rather significantly ahead of NATO in this regard)…so I am somewhat surprised to see them complaining about a lack of capabilities?! I presume, this might touch on a lack of having sufficient stock of missiles instead of a lack of capabilities per se?! Have you seen anything about what the Russians are doing about the pilot training for these aircraft? And do they have enough fuel to have these pilots be proficient? As of last year these two issues have been almost as important to the VVS as the lack of modern aircraft/munitions.